It’s a beautiful May afternoon and we hope to launch the Shuttle in less than two months. I just finished a major inspection by an OSHA team and our company has retained the coveted Voluntary Protection Program Star designation. We are one of only 1600+ VPP Star work-sites in the six million work-sites nationally. First I have to announce the passing of Brad Beck for those of you not on the Redtag Net. I first heard about it from Mike Quinton by email: "It is with great sadness that I inform you of the passing of our friend and colleague, Brad Beck. Brad died after a long illness on February 11, 2006, at his home in Post Falls, Idaho. Brad was my roommate for the last half of our second class year and all of our first class year. We didn't plan any trips to the moon but we had a good time. He remained a good friend over the years since graduation. He is survived by his wife, Gail, son, Eric, stepdaughter, Kathy, and a grandson. He will be missed by all of his family and many friends." Got a reply from Bob Felts: "Mike, Been off line for a couple of days. I am very sad to hear of Brad's passing. I enjoyed his comments on the network and will remember him for the only pilot to survive being sucked out the window of the KC-135. Quite a guy -- never even mentioned he was ill in his emails. Please send address so I can write his family. Rest of you turkeys get to Sam's site and post some memories for posterity." Got an email from Pete Robinson that shows once again how small the world is. 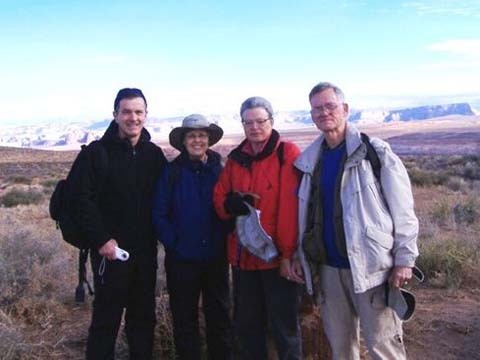 "Pat and I were starting a hiking trip in an Elderhostel in Page, Arizona, on March 12th. When we rode up to our room in the elevator, the other people in the elevator seemed to have a flash of recognition along with us. It was Jerry Smith and his wife Freddie. We spent the next four days hiking some beautiful country near Lake Powell and the Colorado River with the rest of the group we were with. We had fun renewing acquaintances, reminiscing about cadet experiences, and getting some great exercise in a spectacular setting. It's also great to know that we can still hike in some moderately challenging terrain for several miles. Jerry may add some thoughts that I've left out. I've attached a couple of pictures. Thanks for everything that you do for the class as scribe. Pete Robinson"
See accompanying picture showing Jerry and Freddie on left with Pat and Pete on right. It was nice to hear about Jerry and Pete again since I had visited with both of them last year. There was a Redtag Get Together in Albuquerque last May with Pete and another Get Together in Dallas with Jerry in August. Got this missive from John Flanagan’s stepson: "I wanted to send a brief message to be included in checkpoints along with some pictures. I have also CC'ed this message to the class of 1962 scribe. I am still in AFSOC at Eglin AFB and things are going very well. Being assigned here since 1999 has given me the opportunity to see many classmates come through Hurlburt, Eglin and Tyndall. I also see Chris VANCE quite a bit. 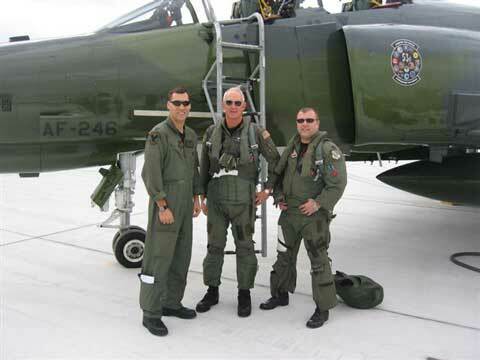 He is assigned to Tyndall flying QF-4's. He recently arranged for my stepfather, John FLANAGAN '62, to tour his squadron at Tyndall and to give a heritage presentation. Along with this presentation, Chris was able to arrange an F-4 flight for my stepfather (who had had a few back seat F-4 sorties in Vietnam). Chris was the IP for this flight, and while I was told that my 66 year old stepfather could not pull as many G's as he could in the old days, they still had a great time flying around the Tyndall MOA's. I have included some pictures of the three of us at Tyndall, I hope that this letter gets to you in time to make the next issue of Checkpoints. Take care. Nate Scopac." The picture shows John and his stepson, Nate Scopac ’97 and Chris Vance ’97. John is the gray-haired one. 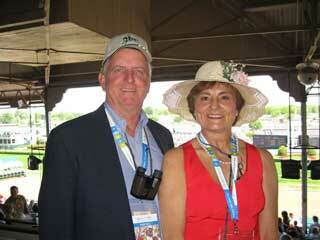 I got an email from Owen Hawkins showing me his trip with Connie to the Kentucky Derby in early May. This was a surprise weekend for Connie; "she has always wanted to go since she was a child". " Really glad we went" said Owen ..."lots of beautiful women with fantastic hats". Just sad that this was Barbaro's final win. I was in Atlanta the week after Easter to help put on a conference for the VPP Region 4 organization. As Chairman of the Board of Region 4, I felt a lot of responsibility for making the conference a good one. As it turned out, it received rave reviews from the 600+ attendees. Made me feel satisfied. While I was there, I had dinner at Steve Mettler’s house with him and his lovely and gracious wife, Kathryn, and Dave Holt. We had a great evening in spite of the rainstorm that drove us off the back porch into the house. In her spare time, Kathryn does some lovely painting. Dave is into real estate and enjoying it very much after many years as a teacher. I guess that’s it for now. Don’t forget the reunion next year. Should be a great one. I’m looking forward to seeing as many of you as possible. If you keep in touch with one of our Lost Souls, please invite them and encourage them to attend. Go Redtags! 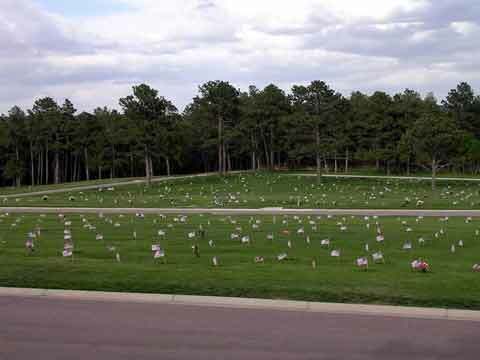 Jim Mack sent the following on Memorial Day and I thought it should be included in this month's issue of CheckPoints. 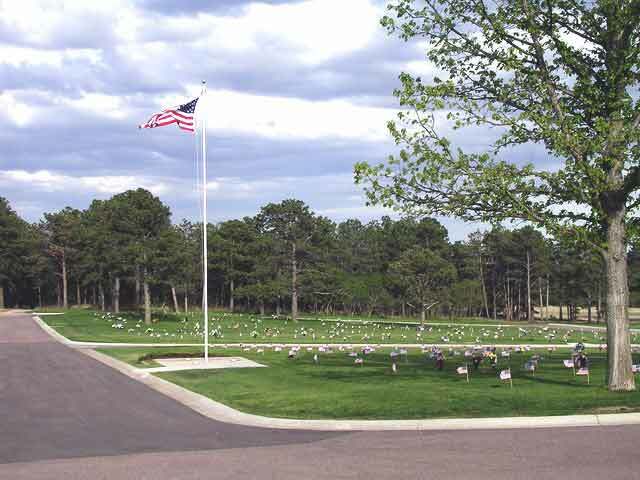 FYI guys, I just returned from the USAFA cemetery. 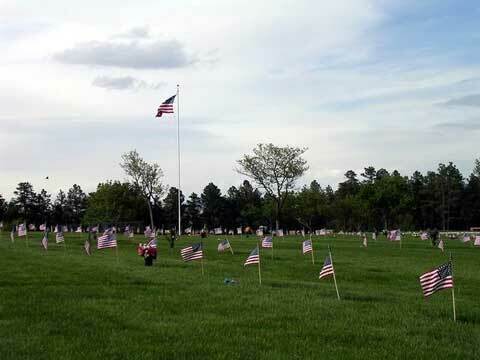 At high noon, with crystal clear skies, a perfect temperature of 70 and a wind from the South at a steady 15 knots, the 1000 or so small flags, one on each site, standing tall in deep green grass made for some beautiful and poignant pictures. The stillness and memories were deafening.